Voices in Britain (est. 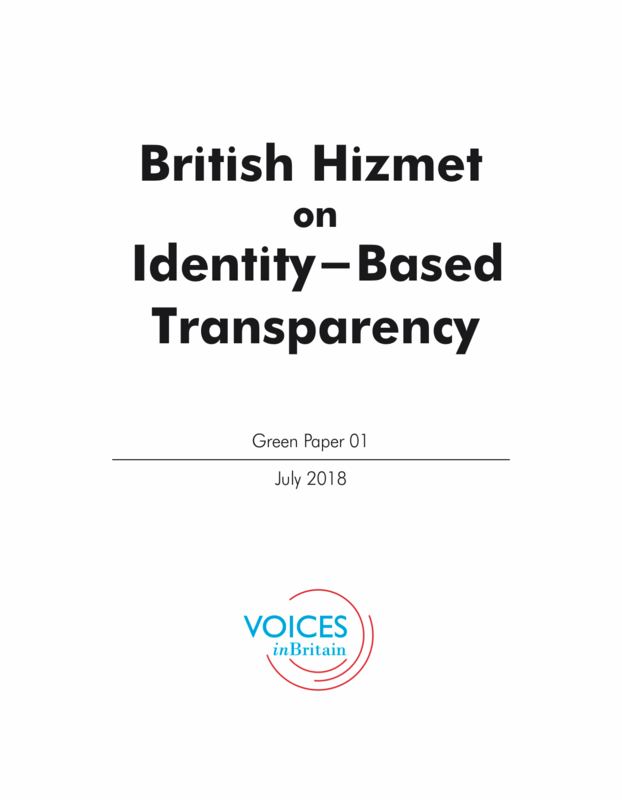 2012), a network of Hizmet-inspired organisations in Britain, is pleased to present its first ‘green paper’ titled ‘British Hizmet on Identity-Based Transparency’. Hizmet is a social movement primarily focused on education, dialogue and relief work. It came about as a result of the teachings and practice of Fethullah Gülen. Voices is not a legal entity and does not replace the decision-making processes of its member organisations (more information on Voices, and its full list of member organisations can be found here). As Voices, we have decided to publish a series of ‘Green Papers’. In the British context, a green paper traditionally refers to a preparatory document that aims to provoke discussion and elicit feedback. Our green papers are preparatory in the sense that they aim to provide an accurate account of our ongoing and evolving internal discussions on a range of contested issues. Our first green paper is on identity-based transparency. We define this as transparency that relates to a particular group affiliation or identity. After a brief introduction, the paper posits the salient issues of identity-based transparency, followed by our respective reflections and responses to each. The paper discusses the challenges of identity-based transparency, some of which have prevented our member organisations from adopting this approach to date. It then goes onto state what our member organisations have achieved so far in this respect and possible points of next action and areas for further discussion. Voices is a consortium network of Hizmet-inspired organisations in Britain. ‘Voices’ stands for voluntary organisations to inspire, connect and empower society. For more information on who we are, what we do and our member organisations, please visit vociesinbritain.org.